“West Indies” hot sauce, which is yellow in color and made with habanero peppers, is my all-time favorite style of hot sauce. It’s usually very spicy, but not in an “I’m only eating this to show off” kind of way, like Dave’s Insanity Sauce. It also has the best flavor of any hot sauce I’ve ever tried. Sure, Tabasco sauce is good, but it mostly tastes like peppers and vinegar. Sriracha is pretty tasty, but isn’t all that complex. 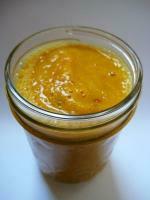 West Indian style hot sauce, on the other hand, brings a lot of flavor to the table! Lisa bought a giant habanero plant at Aldi a few weeks ago. It’s actually more like a “habanero bush”! So, with a surfeit of peppers, I decided to make some hot sauce myself! 1) Trim off the tops of the peppers. Be careful! The oil from the peppers can get on your hands and will hurt if you touch your eyes or nose afterwards. Either wear latex gloves or remember to wash your hands after handling! 2) If using mango, peel and pit the fruit, then cut into chunks. If using pineapple, drain juice into a bowl or measuring cup and reserve. 3) Put the vinegar and mustard in a large sauce pan and mix well. Heat on HIGH until mixture begins to boil. 4) Add fruit, peppers, and spices and stir well. If you have pineapple juice, add a splash of it to the mixture. Lower heat and simmer for five minutes. 5) Remove from heat and allow mixture to cool to room temperature. 6) (optional) It’s not required, but it’s a good idea to sanitize any bottles or jars before adding the sauce. To do this, simply put the bottles or jars in a pot of water and boil for ten minutes. Also boil any lids or caps you may use, but watch them carefully: if the lids are plastic, the boiling water might warp them. Carefully remove all items from water with tongs and let cool on a clean paper towel. 7) Once pepper mixture has cooled, transfer to a blender and puree for 15-20 seconds. The sauce will be thick, like ketchup. If you’d like to thin it out some, add vinegar until desired consistency is reached. If the sauce is just too hot for you, add some pineapple juice and puree again. 8) Using a funnel, transfer to small bottles. The sauce can be eaten immediately, but tastes better after a week. For best longevity, keep refrigerated. Recipe as I made it makes approximately 25 ounces of hot sauce, but yield may vary depending on how much you thin the sauce. Next PostNext Fun with Factory’s Catalog!